The UGA and ULT Series Universal Gas Analyzers are state-of-the-art bench top mass spectrometers that operate from above atmospheric pressure to UHV. They are ideal for on-line monitoring and analysis of gas mixtures. Whether you’re measuring trace-level contaminants, solvents, hydrocarbons, refrigerants or corrosive gases, your Universal Gas analyzer is up to the task. UGA applications include semiconductor exhaust gas monitoring, glove box analysis, fuel cell studies, Freon detection, pollution monitoring, fermentation studies and general R&D vacuum analysis. These analyzers are also simple to operate and maintain. The chassis design allows the instrument to be operated vertically or horizontally, and both front-panel and computer operation are supported. The ULT series is a simplified design for less demanding applications. The UGA system uses a two-stage pressure reducing inlet to sample gases at atmospheric pressure. After the pressure is reduced to around 10-6 Torr, the gas stream is sent to a mass spectrometer (residual gas analyzer - RGA) which measures the concentration of each mass of interest. 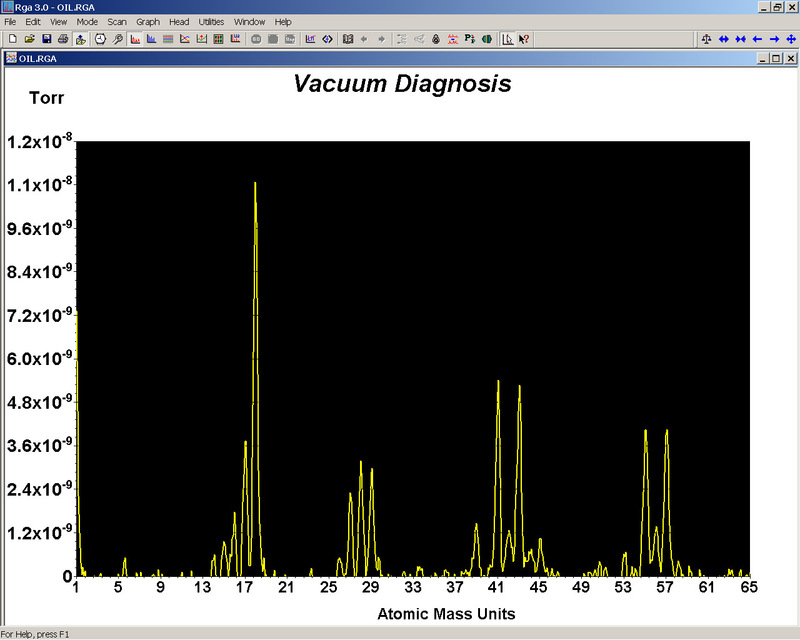 The UGA Windows software provides a graphical user interface for complex graphing and data analysis. The software also allows remote control of the system’s valves, heaters and pumps. For gas sampling in the range of 10-1 to 10-4 Torr, the vacuum inlet assembly is used. Simply attach a 2 ¾” CF to ¼” tube adapter to one of the CF ports, and adjust the length of the tube for the inlet pressure. 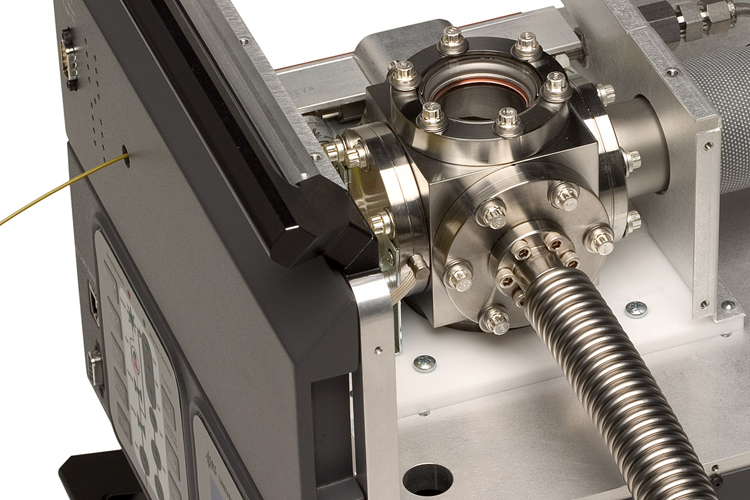 Direct access to the RGA is provided for UHV applications (<10-4 Torr). Any of the 2 ¾” CF ports of the vacuum inlet assembly can be used to connect to your vacuum chamber. An optional multi-port sampling inlet consists of 16 manifold-mounted valves that can be used with a variety of capillaries. 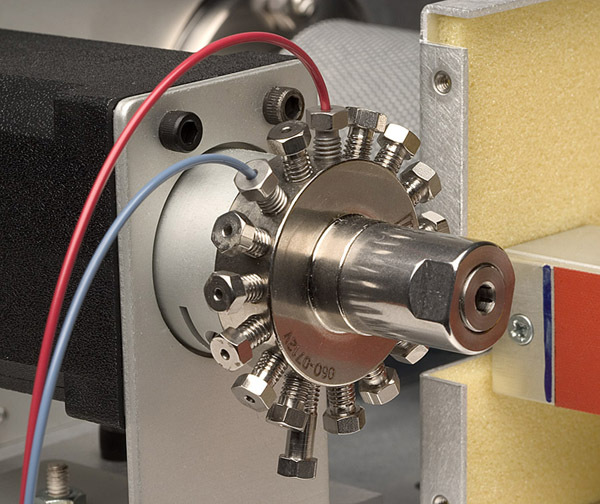 The UGA system is equipped with individual heaters for the vacuum chamber (including RGA), the turbo pump connector, and the vacuum inlet assembly. During bakeout, the system can be heated to 120 °C. Separate diaphragm pumps are used to handle the bypass flow and backing of the turbo pump. This architecture allows corrosive gases (chlorine, fluorine, etc.) to be analyzed without damaging the RGA and turbo pump, and virtually eliminates the problem of back streaming. Measuring high concentrations of low mass gases (hydrogen, helium, etc.) is no longer a problem. An optional valve and inlet to the turbo pump’s exhaust is available for users who wish to vent with dry nitrogen (or other inert gases). This keeps the pump free from water and other contaminants present in air. The UGA system can be controlled from the front-panel or from a computer. A choice of manual or auto-control of all system components is provided. Data is measured and displayed using the UGA software. The intuitive user interface allows measurements to be made quickly and easily. Data is captured and displayed in real-time, or scheduled for acquisition at a specified time. 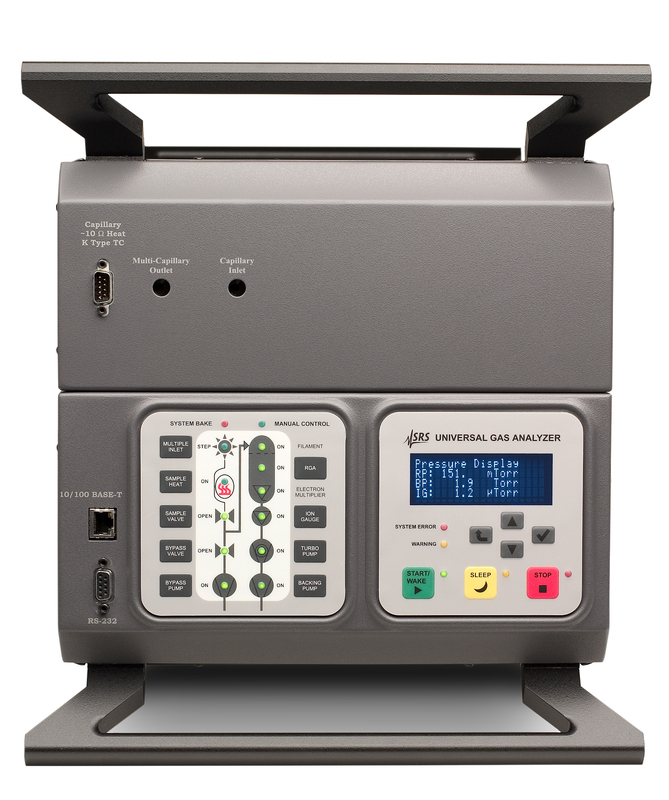 The UGA Analyzers offer the best value of any system currently available. They provide more performance, better features, and are priced well below the competition. Software Windows application. Controls UGA system including RGA. * ULT Series has different specifications. Please refer to the Comparison sheet for details.